What kid doesn’t love a heart shaped food? Maybe they won’t even realize they’re eating veggies! Haha, okay, that might be taking it a bit too far. But, I do think they’ll enjoy these. Got picky eaters? let them help you cut out the hearts. The experts say, that if kids help prepare the food they are more apt to eat it. Make a date for an afternoon snack. 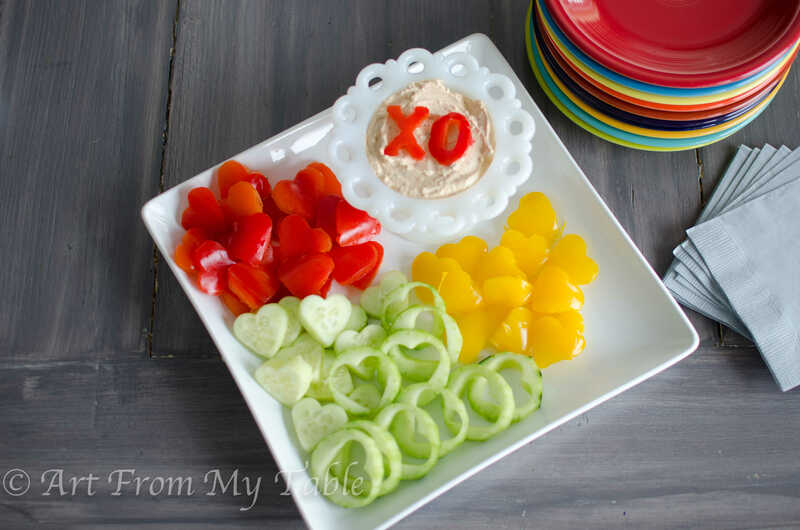 To make these, use a small heart shaped cookie cutter to cut hearts out of some veggies. I used bell peppers and cucumbers. This also works will with bread, tortillas or pita bread. Tortillas and Pita are even more tasty warmed up. 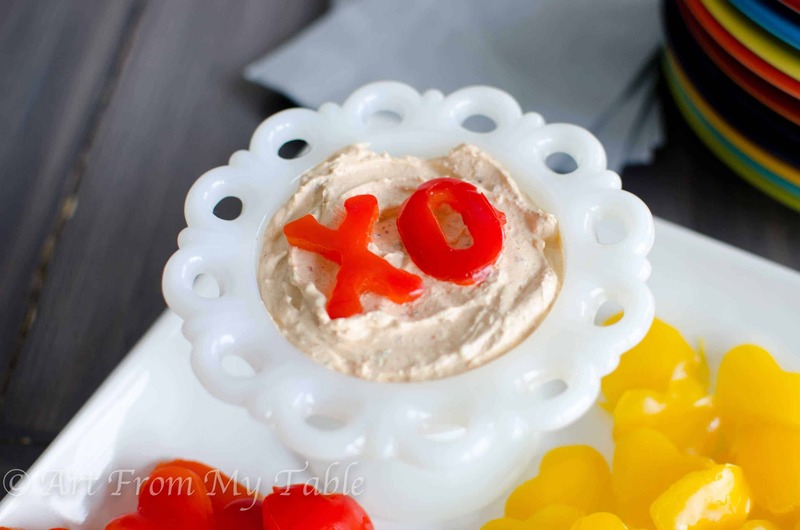 Here I’m serving the veggie with jalapeno yogurt dip, but Homemade Ranch Dip is also a perfect match for these veggies, and Hummus pairs well with the breads. Use an oven mitt on your hand while cutting out your shapes so your palm doesn’t become sore. Thanks Gourmet Mom On The Go for that awesome tip! What do do with all the scraps? These are the cookie cutters I have. 1 cucumber peeled and sliced thick. Slice the peppers from top to bottom on each side to form 4 pieces that are somewhat flat. They won't be completely flat, but it will work fine. 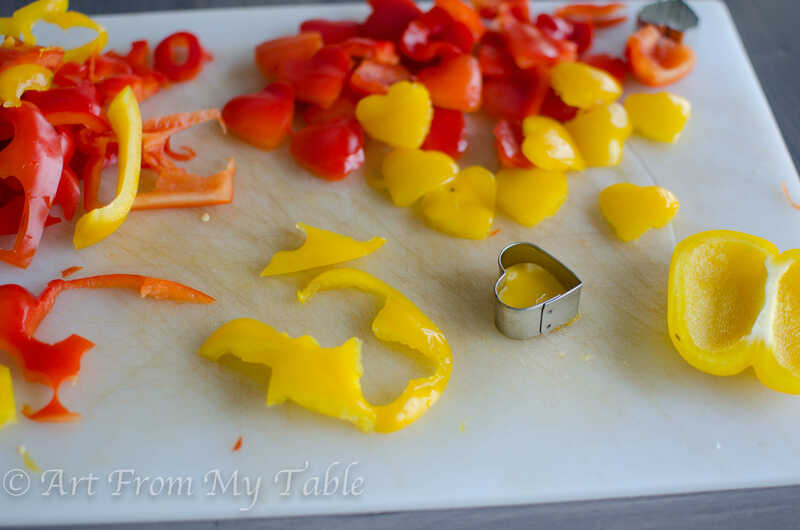 Use the cookie cutters to press out heart shapes. An oven mitt is a great help here to avoid your palm getting sore from the pressing. 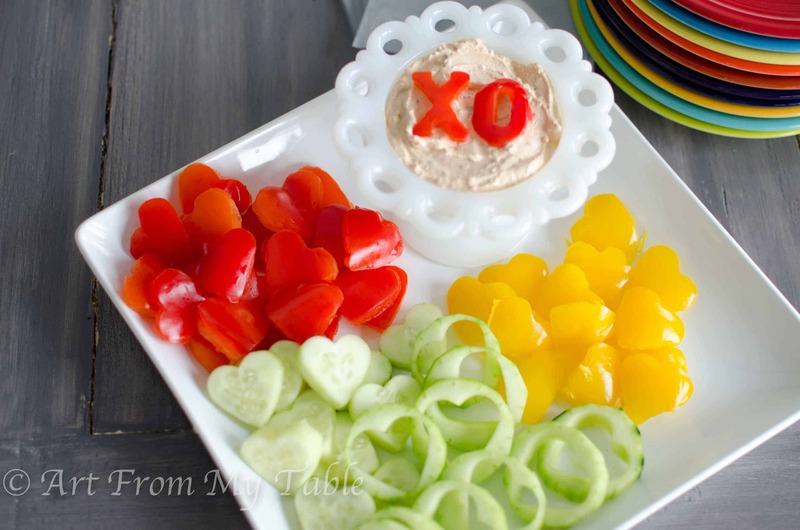 How do you make Valentines Day a little healthier? Have any Great Valentine snack that is sugar free? Or maybe just a valentine to give out that’s not food? I’d love to hear about them in the comments! Don’t want to miss a single recipe? Subscribe to get FREE recipes delivered straight to your inbox, plus receive a FREE cookbook! Adorable!!! Love, love, love it Chellie! Thanks for sharing! So glad you found something you can use! I stopped by your blog… so fun!